Ideal for beginners, this island instrument makes the sweet sounds of summer all year round. 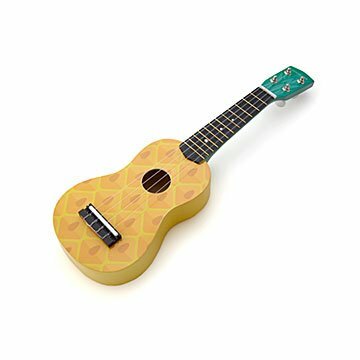 Strumming on the sands with a piña colada or picking a tune at a backyard party, this pineapple ukulele gives gatherings a playful island touch. The Polynesian instrument is ideal for beginners with just four strings, as opposed to a six-string guitar. Compact and ready for travel, the cheerful wooden design makes a great gift for musical friends or loved ones who keep the summer vibes all year round. Made in China. I would not buy this again. It was cheap and not what I thought a ukulele should be. The pineapple theme was cute but not for the serious student/player. I returned it and bought the real thing from a music store. You get what you pay for.